Break out your crepe pan! It’s Maslenitsa, Russia’s raucous and riotous Shrovetide! Maslenitsa is the weeklong carnival before Orthodox Lent begins. But its origins and traditions, including its signature pancakes, are much older. Maslenitsa is a moment when perhaps I catch a hint of that infamously elusive “Great Russian Soul.” This may be because, of all the Russian Orthodox holidays that took over their ancient solar calendar precursors, Maslenitsa remains the most unapologetically pagan. Like its equivalent, French Mardi Gras and Anglo-Saxon Shrovetide, Maslenitsa is a ritual banishment of winter and a rapturous welcome to spring. Like all Carnivals, Maslenitsa encourages us to get excess out of our systems before the 40-day rigors of Christian Lent. In Russia, Maslenitsa inspires expansive hospitality, so much a part of the national character, as well as that tendency to go slightly overboard on a feast, in the sure and certain knowledge that famine may lurk just down the road. There is the fun of masquerade, coupled with the slightly more worrying possibility of a fistfight breaking out. There is vibrant color, lively music, and vivid firelight. And pancakes. Lots and lots of pancakes. The menacing aspect of Maslenitsa is a legacy of its pagan origins, celebrating the deity of spring, fertility, fire, and passion. This is Yarilo or Jarilo, the tenth son of the Slavic thunder god Perun. In his youth, Yarilo is kidnapped by Veles, the god of the underworld in an echo of Greek Persephone. In the Slavic version, the underworld is a verdant paradise where it is always sunny, green, and the earth is always damp and fertile. Yarilo is portrayed as a beautiful youth, gifted in both the arts of war and the wisdom of peace. He protects the weak and helpless against evil forces, lending many of his associations and attributes to the Christian St. George. To coax Yarilo back, the ancient Slavs performed numerous fertility and fecundity rites, and many of these traditions are still integral to the celebration of Maslenitsa. Because Yarilo embodies qualities that are at odds with one another — ferocity, strength, and courage as opposed to beauty, fertility, life, and warmth — many of the rituals involve inverting reality through masquerades, pretend battles, and mummers’ plays. Yarilo is locked into an annual life-death-rebirth cycle and yearns for his twin sister and lover Morena, who symbolizes the damp rich earth. Their reunification is the catalyst for the crops to begin to grow. They reach the zenith of their power and intensity of their passion on the summer solstice, celebrated at Ivan Kupala, or St. John’s Night. But when Yarilo departs in the autumn, Morena’s beauty fades, and she becomes a withered crone until the spring returns. This is why the spring equinox was celebrated in Russia as the New Year until as late as 1348. To coax Yarilo from the underworld, fires are lit to symbolize the sun. Round, sun like symbols dominate Maslenitsa: troika rides around the village with torches propitiate the spring sun, as do the signature food of Maslenitsa: pancakes, which are present throughout life and eaten at funerals to symbolize eternal life. For the ancient Slavs, a ritual feast at the beginning of the year with as much rich food as possible represented the most efficacious way of vouchsafing a bountiful harvest. For Orthodox Christians, Maslenitsa and Lent offer a handy liturgical excuse for rationing dwindling winter stores before the spring planting can begin. To banish winter, villagers built large snow forts and held mock battles to conquer the fort, thus triumphing over the snow and ice. Snowball fights, and wrestling matches also played a symbolic role. The week of Maslenitsa is divided into specific activities for each day. On Monday, Maslenitsa begins by the construction of an enormous straw doll of winter’s effigy and parading her about the streets in a troika. Tuesday is reserved for masquerades and mummers’ plays as well as the officially sanctioned day for young lovers to play court. On Wednesday, mothers-in-law invite their sons-in-law for blini, no doubt to fortify them for the challenges ahead on Thursday when the snow fort battles and fistfights are waged. Friday the sons-in-law return the favor, inviting their mothers-in-law for blini. On Saturday, it is the turn of the (ever oppressed) daughters-in-law to welcome everyone to a feast, and on Sunday, when all of the butter, cheese, milk, and blini are gone it is time to burn the effigy of Maslenitsa, banish winter for good and begin the quiet contemplation of Lent. The “Daughter-In-Law Gathering,” is a nice way of saying that everyone has to come to yours for brunch. Not to worry: a Maslenitsa party requires only piles of hot, buttery pancakes and a range of both sweet and savory fillings to satisfy the appetites of those just in from conquering a snow fort or beating up a neighbor. Combine all the liquids but the club soda into a cocktail shaker with ice and shake vigorously. Pour into a short “hurricane” style glass. Top up with Club Soda or San Pellegrino. Garnish with orange wedges and Maraschino cherries. To avoid excessive duds, make your batter ahead of time — this recipe certainly benefits from resting a bit (even overnight) — and then get your skillet(s) going about 20 minutes before your guests are due. By the time they arrive, your house will be redolent with that intoxicating eggy, buttery pancake smell; the duds will be securely hidden in the trash bin, and you’ll have banked a lovely stack of pancakes in the oven. This recipe is a composite of several excellent blini concepts: buckwheat flour gives the blini a nutty taste and lovely brown patina; using buttermilk lightens up the batter and adds a flavorful tang. With no fussy yeast proofing or hours-long risings, this recipe is ready to go when you are! It makes equally good small blinchiki as well as bigger crepe-type pancakes. The choice is yours! Melt the butter in a saucepan over low heat. When the butter is melted, use a teaspoon to remove the white milk solids that have risen to the top of the pan. Decant the remaining butter into a glass container and cool to room temperature. This is clarified butter. Sift together the flours, salt, and baking soda in a large mixing bowl. Whisk the eggs and buttermilk together until frothy. Add 4 Tbsp (60 grams) of the clarified butter to the mixture and whisk until combined. Pour the liquid mixture into the dry ingredients and whisk until combined. Cover and chill for at least 30 minutes or up to 12 hours. Prepare a skillet by placing it over medium heat for two minutes. Preheat the oven to 200ºF (93ºC). Prepare an ovenproof metal or glass tray to hold the blini and a length of tin foil to cover the tray. This will prevent the blini from drying out. Combine the remaining clarified butter with 2 Tbsp (30 ml) of vegetable oil in a shallow dish. Impale the potato onto a fork, and then dip it into the oil/butter mixture. Use the potato to smear the heated skillet with the butter and oil mixture. The starch from the potato does something — I’m not sure exactly what — but it makes all the difference to how the blini land on the hot skillet. Repeat this before every batch. Pour batter onto the skillet to form a pancake: a tablespoon will produce a nice-sized mini blini, perfect for canapé with toppings, while a ⅓ cup (75 ml) will yield a decent, crepe-sized pancake that is suitable for stuffing and rolling. Watch carefully as tiny holes begin to form on the surface of the blini. After 1 minute, flip the blini over and cook for an additional minute. Remove the finished blini to the warmed tray in the oven. You can place a tiny knob of butter between each pancake to help keep them moist and tasty. Blini made ahead can be stored in an airtight container for up to 2 days before consuming. Reheat them in an oven…but be warned, they won’t taste nearly as nice as they do just off the skillet! Slice the salmon as thinly as possible, then cut into long strips. Roll the strips into a rosette. Spoon sour cream onto the blini, then place the rosette on top. 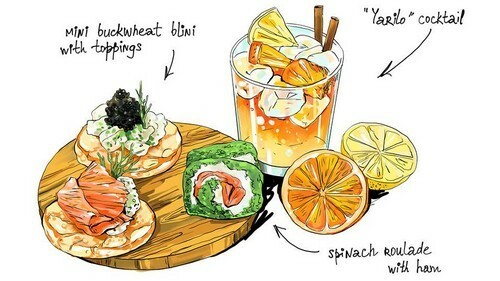 Garnish with fresh dill, a small, thin slice of lemon peel and/or black caviar. Chop Herring into a fine dice and mix with a generous bunch of chopped dill and sour cream: use a very rough 2:1 ratio of herring to sour cream. Both of these work particularly well with mini blini as a canapé. They are a lovely way to get the party going, particularly when paired with a nice cold shot of vodka! Clean and dry 1 lb. (500 grams) of fresh mushrooms then cut them into the smallest possible dice. Melt 1 Tbsp (15 ml) of butter into a shallow pan over medium heat. Sauté the mushrooms until they leech out their moisture, then reabsorb it again (about 20 minutes). Pour 2 Tbsp (30 ml) of sherry or Madeira into the pan and stir until the liquid is absorbed. Spoon in 4 Tbsp (60 ml) crème fraiche. Taste and adjust seasoning with salt and pepper. Garnish with freshly chopped tarragon, parsley, and chives. Melt 2 Tbsp (30 ml) of butter in a shallow pan. Add 4 Tbsp (60 ml) finely minced shallots and sauté until limp. Add 4 cups (1 liter) fresh winter spinach and sauté over medium-low heat until limp. Drain the contents of the pan through a fine mesh sieve and press with the back of a wooden spoon to get rid of all the excess liquid you can. Place the spinach mixture in a bowl and toss with 1 cup (240 ml) of shredded cheese: sharp Parmesan or cheddar will work well, as would Gruyere or Feta. Season with several grinds of fresh pepper. Prepare the tvorog (cottage cheese) by combining it with a small amount of sour cream — use a 5:1 ratio of tvorog to sour cream. Sweeten with sugar or honey to taste. Chill for at least 2 hours. Choose the best quality jam you have access to. In Russia, this often means tapping into your granny’s dacha stash or visiting the farmers’ markets. Excellent flavor pairings with buckwheat blini include sour cherry, sea buckthorn, raspberry, and fig. Smear a generous amount of the tvorog onto hot blini, top with jam, roll up and enjoy! Sweet Blini are marvelous with hot wine or tea with honey and lemon. This daughter-in-law feels that blini and toppings are sufficient for her in-laws, but if you need something else on your Maslenitsa table, you can’t go wrong with this updated version of a very old-fashioned recipe from the New York Times Cookbook. You don’t see this kind of thing much anymore, but it is worth reviving for Maslenitsa. It ticks a lot of the Shrovetide boxes: its round, made from butter and cheese, and it looks like an early morning sun or one of the fire wheels paraded around Russian villages during Maslenitsa. It’s a bit fiddly, but fun to make — it looks very impressive when sliced and plated. Line a 10×13-inch (25×33-cm) baking sheet with a sheet of 13×18-inch (33×45-cm) parchment paper (the parchment paper becomes a higher rim of the sheet). Melt the butter in a large saucepan. Take 2 Tbsp (30 ml) and brush it onto the parchment paper. Use the non-stick spray to cover any areas that the butter hasn’t, paying particular attention to the sides and corners. Sprinkle the Parmesan onto the sheet and set aside. Gently reheat the remaining butter in the saucepan until it is bubbling. Sprinkle the flour into the butter, whisking steadily to combine. When all of the flour has been added, reduce the heat slightly, then whisk for 1 minute. Add the cayenne pepper to the mixture, then slowly whisk in the hot milk. Continue to whisk as the mixture thickens. When all the milk has been combined, stir for an additional minute with a wooden spoon. Remove the mixture from the heat and let cool to room temperature. Add the pinch of salt to the egg whites and beat until they form stiff peaks. Whisk the egg yolks into the milk and flour mixture, then gently fold in the egg whites. Spread the mixture onto the prepared tray and place in the preheated oven. Cook for 18 minutes, until the surface, is slightly browned and bounces back when you touch it. Cool the roll on a rack for at least 40 minutes. As the mixture cools, the roll will contract. When the roll is cool, gently spread the cream cheese over the surface, leaving a ½-inch border. Arrange the smoked salmon strips in adjacent rows along the length of the roll. Sprinkle the herb mixture over the salmon. Use a flat frosting knife to dislodge the roll from the parchment paper. Take a clean tea towel and gently roll the roulade into a log. Use a bit of extra cream cheese to seal the seam. Slice the roulade into ½-inch pieces and arrange on a long platter. A crisp salad of spring greens with a light citrus dressing compliments this perfectly.